This is one of the largest pieces that I have done. 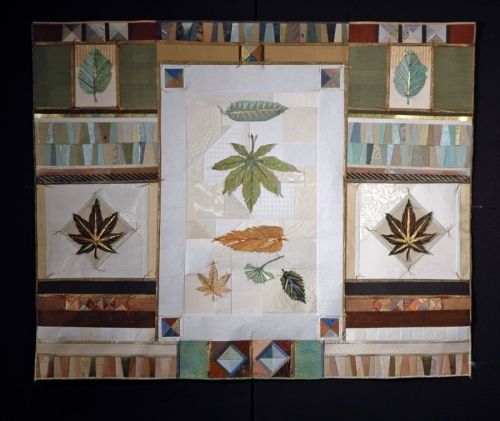 It is based on the crazy quilt blocks and is sewn out of Japanese papers, new and recycled silk and bronze leaf. It was featured in the national show Fantastic Fibers in Paducah, Kentucky. 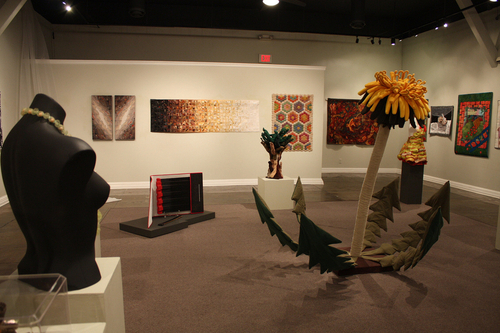 Transformations at "Fantastic Fibers Exhibit"
Transformations Series, 25" x 87" with over 3,600 pieces of handmade Japanese paper, new and recycled silk and handpainted papers. 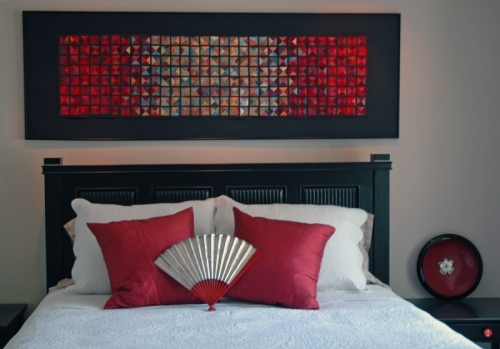 This piece goes through 19 different color changes and blends of color to achieve the light to dark effect. A similar piece is in the boardroom of Dow Chemical in Midland, Michigan. This is the largest one in this series that I have made. Others, in different sizes are available by commission. A modification of a traditional quilt, this mixedmedia paper and silk piece is sewn to resemble DNA Sequencing. I am interested in the geometry and forms of many scientific things which have repeating elements. 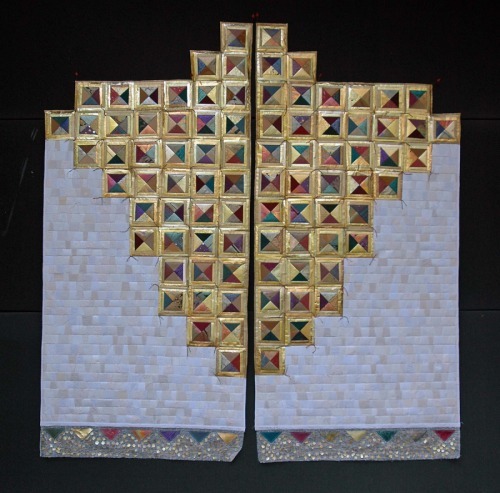 This piece is made of Japanese papers, new and recycled silk and handpainted papers. A smaller version of this piece is in the Healthcare and Aging Building at Rutgers University, 2012. This is one of the most complex pieces that I have done with 4,726 pieces. It is sewn Japanese papers, new and re-cycled silk and in the center, chemically patinated bronze metal leaf and hand painted papers. The center blocks are cut at 3/4" (there are 4 triangles in each block) and the red blocks in the surrounding area are cut at 1 3/4". 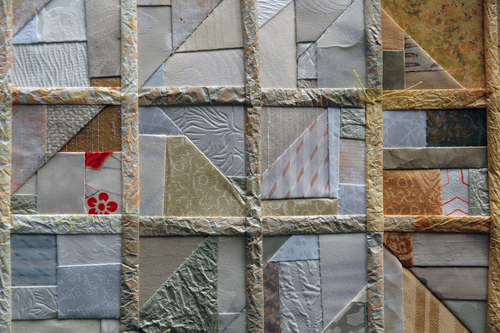 The whole quilt is sewn with 1/2" strips between the blocks with 1/10" seams. 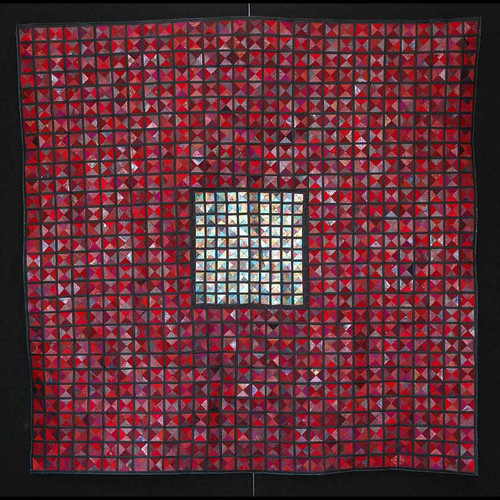 This quilt has been accepted for Quilt National 2009, an international contemporary art quilt show and featured in the book of the same name. Queen bedroom with 24" x 72" Mixed Metals sewn paper and gold leaf quilt. Sewn Japanese papers, new and recycled silk from old kimonos. Framed under glass for permanant installation. 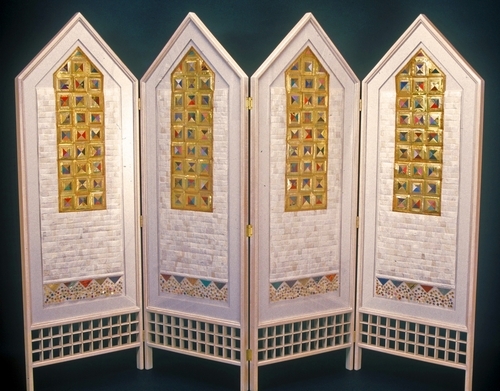 Screen is custom fabricated out of poplar wood with modifications similar to a frame for the presentation of the sewn Japanese paper, silk and gold leaf (metal) piecework. The screen encases the art with Plexiglas. The artwork is mounted on museum board. On loan till 2010 to the FULLER CRAFT MUSEUM for the show, "PULP FUNCTION".